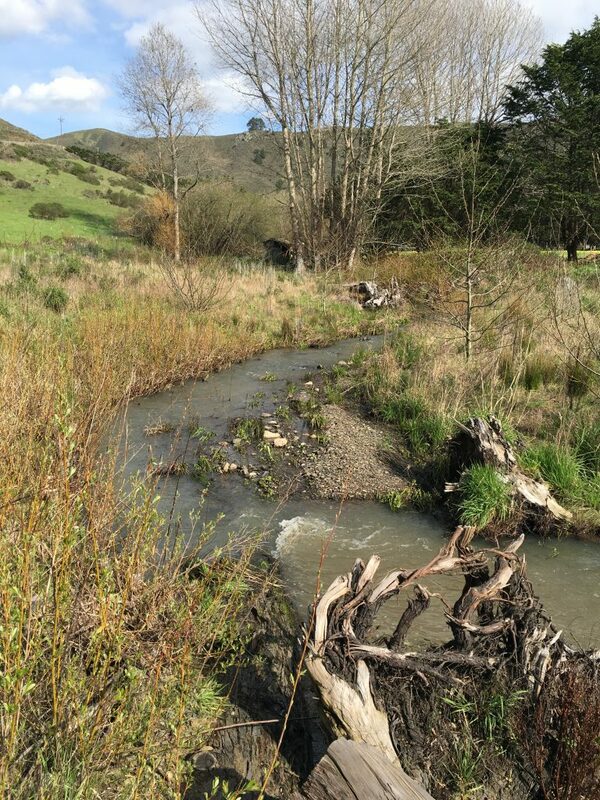 News | Prunuske Chatham, Inc.
As recently covered in the Press Democrat, the nonprofit Kelly Creek Protection Project recently announced that it has succeeded in securing $4.1 million to purchase 44 acres adjacent to the popular Helen Putnam Regional Park in Petaluma. The land had been proposed for housing by property owner Davidon Homes, but now may be added to the park instead. Davidon Homes will retain 14 adjacent acres, where it plans to build 28 homes. 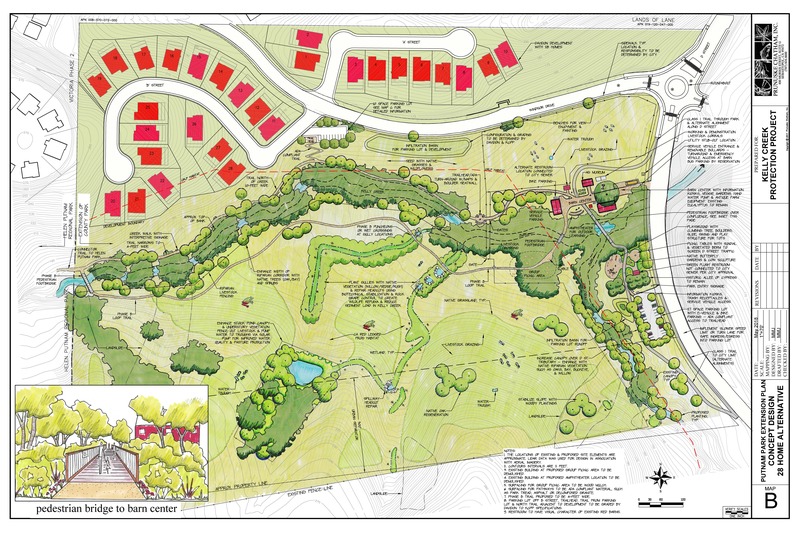 PCI’s Maggie Jensen has been the lead designer on the proposed park expansion project. Kelly Creek runs through the property. A proposed new multi-use path would run along it and connect with the existing park’s six miles of trails. Other proposed park enhancements include rehabilitating the three red barns into an interpretive center, an amphitheater, livestock demonstration areas and a children’s playground. Learn more about the Kelly Creek Park effort here. PCI has worked with local and regional partners on a number of projects to help increase summer flows in coho streams. Designing water storage options allows water users to draw water when flows are high in winter, and then store it for summer use. That leaves more water in the streams in summer for coho and other aquatic creatures, when adequate cool, clean water is a critical need. The Westminster Woods tanks and water conservation mentioned in this video are one example of our work. We’re glad to be part of these important efforts to support healthy fish populations in west Sonoma County streams, and we’re thrilled to watch the positive results! 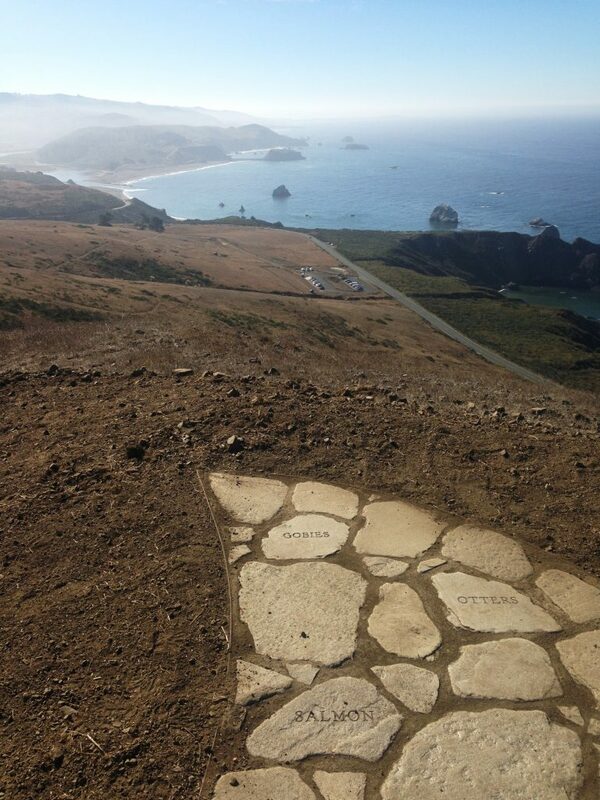 5,630 acres of spectacular lands on the Sonoma County coast are now open to the public, thanks to many years of hard work by a suite of partners (with assistance by PCI!). On Friday, September 7, the Preserve was opened to the public for the first time. The property was acquired in 2009 by the Sonoma Land Trust and the taxpayer-funded Sonoma County Agricultural Preservation and Open Space District. Other funding sources included the California Coastal Conservancy, the California Wildlife Conservation Board, the National Oceanic and Atmospheric Administration, the Gordon and Betty Moore Foundation, and Forest Legacy Program. The Wildlands Conservancy also assisted with funding. In September 2013, Sonoma Land Trust transferred the property to The Wildlands Conservancy to manage as a preserve managed jointly by TWC and Sonoma Land Trust. PCI’s role was to design and assist with regulatory compliance for the new entrance on Highway 1, allowing public access while ensuring a safe entry point, protection of sensitive resources, and maintaining the beauty of this highly visible location. Project components included a trailhead parking lot, ADA-accessible restrooms and day-use area with picnic tables, ADA-compliant access road and trail to trailhead, wetland enhancement, and a restored drainage. The two-tiered parking lot is designed to blend in with the natural topography, and allows for bus parking and emergency vehicle access. Storm water runoff will be retained onsite and infiltrate into a constructed bio-swale and infiltration basin. PCI also completed the biology studies, wetland delineations, visual analysis, managed cultural resource assessments, assisted with community outreach, and prepared construction cost estimates. When you visit, you can take your pick from a challenging 7.5-mile hike up to Pole Mountain on the Sea to Sky Trail, shorter loops near the entrance, or a relaxing picnic at the trailhead with amazing views. Dogs on leash are allowed on Jenner Headlands, but not on Pole Mountain. The Wildlands Conservancy’s trail map is available here. PCI assisted the Sonoma Land Trust with the site design and bridge alternative analyses for an eroding bridge at Live Oaks Ranch, located near the start of the Tubbs fire. 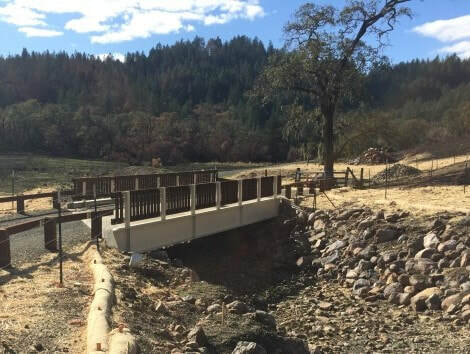 Sonoma Land Trust successfully replaced the bridge in fall 2017, just days before the area caught fire. Firetrucks used the new bridge to access the Live Oaks Ranch property and fight the fire through the night. Read the full story on the Sonoma Land Trust’s stewardship blog. In November 2017, a team of PCI employees, PG&E employees, and 60 Reedley College students and faculty gathered to plant over 600 trees in a riparian area of the Reedley College campus, located 19 miles southeast of Fresno. 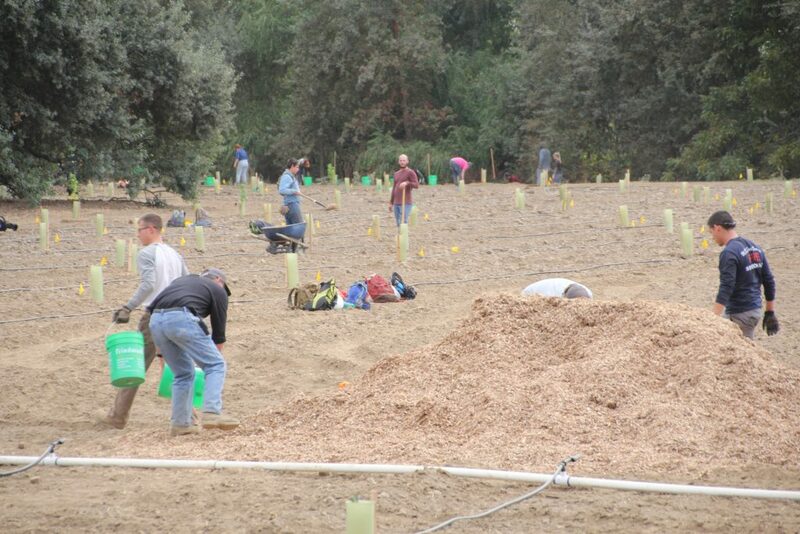 Reedley College was supportive of PG&E planting trees on campus property and expanding the existing riparian corridor near the confluence of the Kings River and Wahtoke Creek. Trees were planted during a “Field Day Weekend” that provided a hands-on learning experience for students from the College’s Department of Natural Resources. 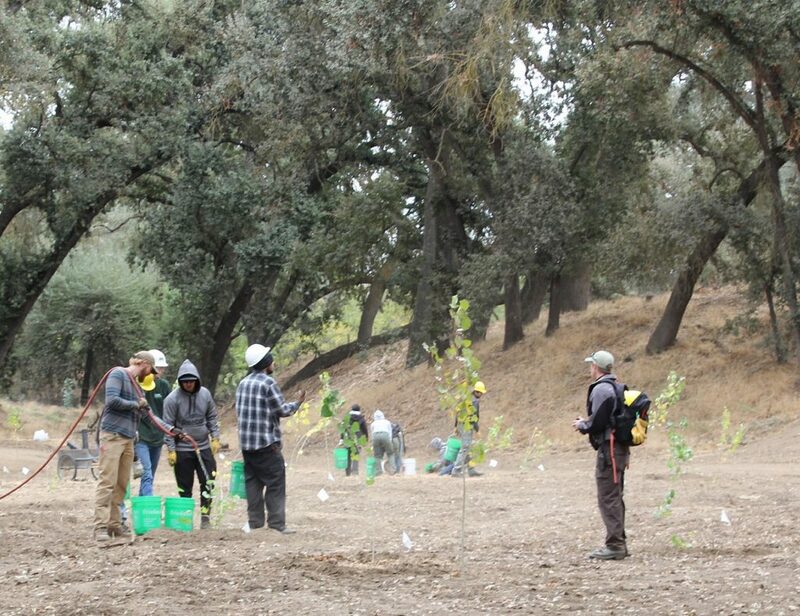 Plantings included native species such as valley oak, black walnut, box elder, and Fremont cottonwood. The health of the trees will be monitored for at least five years. The Reedley Natural Resources Department will continue to utilize the site for ongoing learning opportunities, such as plant monitoring and establishment, for its students. Success in Green Gulch Creek! Hurray! Coho and steelhead were found in Green Gulch Creek last week in the restored, meandering reach designed and constructed by PCI for Green Gulch Farm/San Francisco Zen Center. Two adult red-legged frogs were also spotted hanging out in one of the new pools near a rootwad and complex woody debris jam. The good news was delivered by Darren Fong and crew from GGNRA, who did the monitoring. This CDFW- and NOAA-funded project involved restoring the lower reach of the creek from a steep, straight, concrete-controlled channel to a longer, pool and riffle-dominated meandering reach with installed woody debris and a wide, active floodplain. The objective was to provide year-round rearing for juvenile salmonids and spawning on natural riffles. So far, so good! We completed construction in 2014. We’re thrilled to be part of this effort and look forward to watching it develop and support many more creatures in the years ahead. 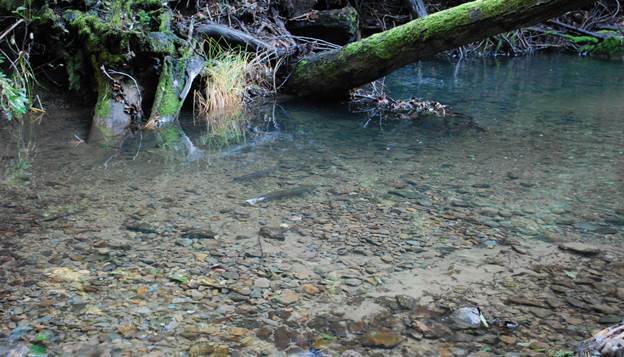 In early December, 2016, coho salmon were seen spawning upstream of the recently completed dam removal project that PCI worked on in Mill Creek near Healdsburg. Staff from the Sonoma County Water Agency and the UC Cooperative Extension/CA Sea Grant’s Coho Monitoring Program documented the fish. A PCI employee also observed a female coho building a redd (nest) immediately upstream of the site while closely attended by two male coho. The project was completed in October, 2016, by PCI working in partnership with Trout Unlimited, NOAA, CDFW, and neighboring landowners. It restores access to 11.2 miles of prime coho and steelhead habitat upstream of the removed flashboard dam. More detailed information about the project and Mill Creek’s importance as coho habitat can be found in the “Mill Creek fish passage featured in Climate.gov” post below and at: https://caseagrant.ucsd.edu/project/coho-salmon-monitoring/habitat-enhancement-monitoring. As of January 4th, 2017, the Coho Monitoring Program estimated that at least 19 adult coho had made it past the remediated dam site. Program staff have also observed eight coho redds in the upper reaches of Mill Creek, which is more than have been seen in the past eleven years combined! This is a great success in the continued efforts towards coho recovery in the Russian River. Coho salmon female and jack next to redd, upstream of Mill Creek Dam Fish Passage Project on 12/3/16. 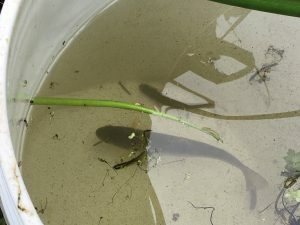 A jack is a male salmon that matures and returns one year earlier than other adult salmon to carry out spawning and is thus smaller than other adults. Photo courtesy of The Coho Monitoring Program. 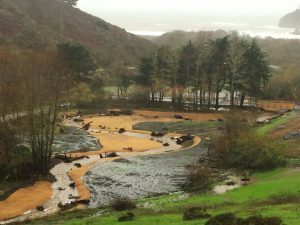 PCI designed this project to restore streamflow at critical times for coho and steelhead in Salmon Creek – check it out!